Sustainability Archives - Blackburn Architects, P.C. : Blackburn Architects, P.C. I’ve always made it a point to use passive renewable design elements and sustainable materials in my equestrian designs. The motivation is designing for the health and safety of horses, so it’s not surprising that what’s recommended for creating human and eco-friendly structures is also recommended for equines. Nowadays, Blackburn Architects’ team rarely encounters a client who isn’t enthusiastic about including sustainable design principles in their farm program. With green technologies evolving every day, there are more systems and product choices available to suit the unique demands of equine properties. The most prevalent elements include natural light and ventilation, recycled materials and regionally sensitive natural woods and products. 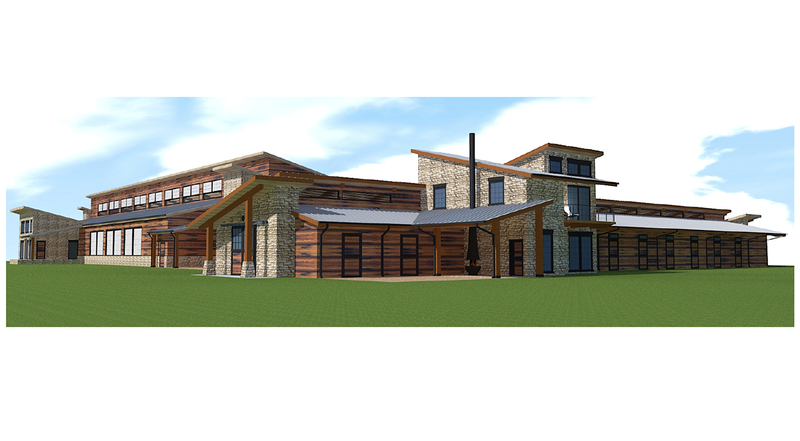 We incorporate recycled and sustainable materials into the firm’s barn designs. We’ve used recycled rubber bricks and pavers for aisle flooring, and recycled rubber mats for stall floors, and occasionally, stall walls. Not only are these products more comfortable for the horses’ legs and knees, but they also provide a slip-resistant surface. As for building materials, we use everything from FSC (Forest Steward Council) certified lumber and recycled steel to fly ash concrete blocks and recycled wood. However, we are always mindful of what some recycled material mixtures contain. Some products include substances (plastics, resins, binders, etc.) that could be toxic to horses through off-gassing or if they chew on the material. If you’re designing your own facility, be sure your builder is familiar with the materials ahead of time and is comfortable working with them. Occasionally, we’ve run into a situation where the builder is unfamiliar with a product recommendation and accidentally convinces an unaware owner to use a product that may exhibit these harmful qualities. It’s important that building materials make sense for both the design and the climate. In more northern locations, we try to design with timber that will provide more insulation for the structure. In the south, a masonry-style building helps keep the structure cool and is more resistant to humidity and insect infestation. While bamboo is an excellent renewable resource option, it’s not often locally sourced and can be costly to ship. Douglas fir and southern yellow pine are the typical go-to lumber products for our firm. They are quality assured, sustainably harvested, and regionally sensitive. When combined with low VOC (Volatile Organic Compounds) finishes and paints, these materials make for sturdy, sustainable buildings that do not sacrifice quality or aesthetics. Conserving water is imperative to any agricultural property, and there are many top-to-bottom green approaches to consider. It’s crucial to intercept and collect storm water before it becomes ruinous run-off that can affect ground water and nearby ponds and streams. We frequently use porous or “popcorn” asphalt for interior and sometimes exterior floor covering. It’s “self-healing” and aids in water drainage. Since many horse farms around the country face changing weather extremes (torrential rain and drought come to mind), rainwater collection systems are vital for alleviating the resultant water issues. Roofs can be designed to route storm water into cisterns. The harvested water can then be channeled into irrigation systems for fields, paddocks, arenas and pastures, or collected for controlled distribution to prevent muddy conditions. In addition to passive systems, I highly recommend including active renewable systems in the design of any horse farm. The beauty of equine and agricultural properties is that they often feature characteristics that compliment these systems. Large swaths of land can facilitate geothermal power systems or wind-powered generators and other equipment. Roofs with large surface areas are common features of many agricultural buildings and make perfect platforms for solar panel systems. One of the firm’s current projects is an extremely energy efficient property in Missouri. While targeting net-zero energy use, we’ve included a geothermal heating system and solar panels that power infrared heaters in the wash stalls. Green technologies have come a long way and today’s solar panel systems offer more choices for collecting and storing energy. If designed properly and in the right location, it is often possible to fully rely on the solar panels for all your energy needs. Including these systems in conjunction with natural light and ventilation could conceivably eliminate outside energy dependency for your equine buildings. Over time, solar panels will pay for themselves in savings. Check with your local and state government about tax incentives for incorporating green energy saving systems into your property. Accomplished with steep sun-heated roofs and vented skylights, the combined effects of the Bernoulli Principle (an equation of vertical lift championed by Dutch-Swiss mathematician Daniel Bernoulli) and the chimney effect (air pulled in low and vented up high) circulate fresh air throughout the structure while flooding the space with natural light. This method provides the optimal environment for horses because it turns the typically static barn into a machine while imitating the equine’s natural environment. The process significantly cuts down on the cost and operation of electric lighting and fans and the health and safety risks they can create. One of the challenges we sometimes encounter with clients is convincing them to include active systems in their design programs. This is usually due to upfront costs. The price impact can be minimized by smart design decisions. Knowing ahead of time what green options are available and which ones you’d like to incorporate will inform your budget early on and, if need be, help you plan the property with future installations in mind. Composting is another great passive renewable option. We strongly encourage all our clients to include a composting system in their design program. Composting helps manage muck and removes harmful bacteria and other organisms to create natural fertilizer for paddocks. It also helps keep organic material that could produce harmful uncontrolled run-off out of landfills. Sustainable barn design is about what’s healthiest and safest for your horses. Remember, horses were never meant to be inside. But if they’re going to be, then it’s important to create an environment as close as possible to what they would encounter in nature, using materials and techniques that at the same time don’t harm the very environment they come from.